A camera profile is often a combination of a color lookup table (LUT) and a tone curve which is applied to a RAW file to get a developed image. It translates the colors that a camera captures into the colors they should look like. If you shoot in RAW and JPEG at the same time, the JPEG file is already a developed picture. Your camera can do color corrections to the data it gets from the sensor when developing a picture. In other words, if a certain camera tends to turn blue into turquoise, the manufacturers internal profile will correct for the color shift and convert those turquoise values back to their proper hue. The camera manufacturer creates a tone curve for the camera and understands what color drifts the camera tends to capture and can correct it. Also RAW files normally look very dull and the profile will allow it to look more pleasing with just one click. We can mimic what the camera does using a tone curve and a color LUT. We want to do this as the base curves provided by darktable are generalized for a manufacturers sensor behavior, but individually profiling your camera can provide better color results. Why do we want a color profile? The camera captures light as linear RGB values. RAW development software needs to transform those into CIE XYZ tristimulus values for mathematical calculations. The color transformation is often done under the assumption that the conversion from camera RGB to CIE XYZ is a linear 3x3 mapping. Unfortunately it is not because the process is spectral and the camera sensor sensitivity also absorbs spectral light. In darktable the conversion is done the following way: The camera RGB values are transformed using the color matrix (either coming from the Adobe DNG Converter or dcraw) to arrive at approximately profiled XYZ values. 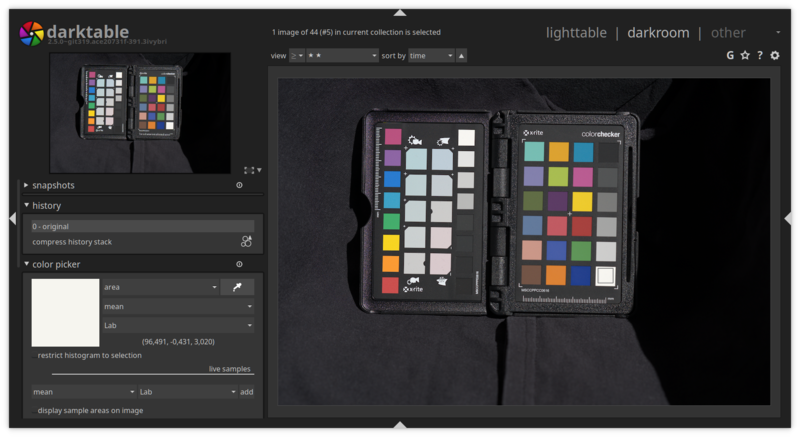 darktable provides color lookup table in Lab color space to fix inaccuracies or implement styles which are semi-camera independent. A very cool feature is that a user can edit the color LUT. This color LUT can be created by darktable-chart as this article will show so that you don’t have to create it yourself. What we want to have is the same knowledge about colors in our raw development software as the manufacturer put into the camera. Therefore we have two ways to achieve this. Either we fit to a JPEG generated by the camera, which can also apply creative styles (such as film emulations, filters), or we profile against real color reproduction. For real color a color target ships with a file providing the color values for each patch it has. In summary, we can create a profile that emulates the manufactures color processing inside the body, or we can create a profile that renders real color as accurately as possible. The process for both is nearly identical, and we will note when it diverges in the instructions. To create the required pictures for camera profiling we need a color chart (aka Color Checker) or an IT8 chart as our target. The difference between a color chart and IT8 chart is the number of patches and often the price. As the IT8 chart has more patches the result will be much better. Optimal would be if the color target comes with a grey card for creating a custom White Balance. I can recommend the X-Rite ColorChecker Passport Photo. It is small, lightweight, all plastic, a good quality tool and also has a gray card. An alternative is the Spyder Checkr. If you want a better profiling result, you can buy a good IT8 chart from Coloraid (you want C1) or invest for example in the ColorChecker Digital SG. (Please share you experience if you buy a Coloraid C1!). I recommend getting a gray card as this makes profiling easier. The path might differ depending on the distribution you’re using. Your package management tool should provide a way to list all files of a package so it should be easy to find. is a possible alternative to track down where the files are located. We are creating a color profile for direct sunlight conditions (D50) which can be used as a general purpose profile. For this we need some special conditions. 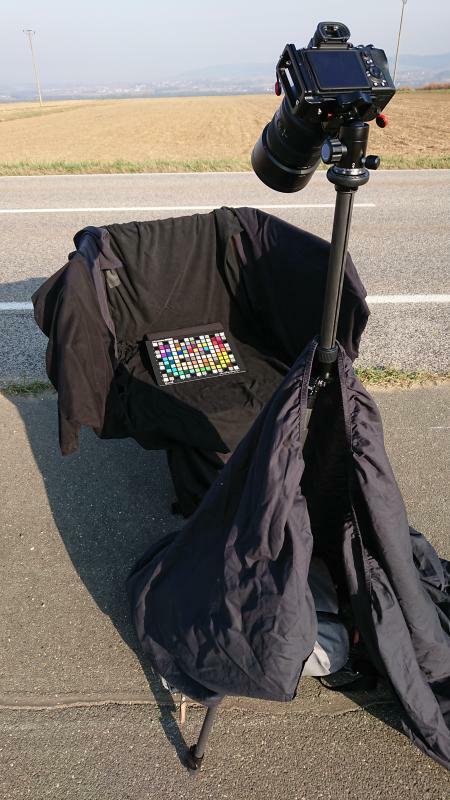 The Color Checker needs to be photographed in direct sunlight at 5000K (K = Kelvin), which helps to reduce any metamerism of colors on the target and ensures a good match to the data file that tells the profiling software what the colors on the target should look like. However a major concern is glare, but we can reduce it with some tricks. One of the things we can do to reduce glare, is to build a simple shooting box. For this we need a cardboard box and at least three black T-Shirts. The box should be open on the top and on the front like in the following picture (Figure 1). To further reduce glare we just need the right location to shoot the picture. We want to shoot the target when the sun provides a temperature of 5000K (D50). We get that in the morning hours when the sun is at about 45° in the sky. It varies on where on earth you are located and on the season of the year. I took my shots in central Europe in mid October at 09:45. To measure 5000K I used a gray card for white balancing. When I shoot the gray card, my camera displayed which temperature the profile has. Try to shoot on a day with minimal clouds so the sun isn’t changing intensity while you shoot. The higher the temperature the more water is in the atmosphere, which means the quality of the images for profiling might be reduced. Temperatures below 20°C are better than above. In some countries it may not be possible to accurately produce these images with sunlight. This could be due to air pollution (or lack of), temperature, humidity, latitude, and atmospheric conditions. For example, in Australia, one might be unable to use direct sunlight to create this profile, and would have to use a set of color balanced bulbs with the same box setup to create this. If you want to shoot outdoor, look for an empty tared parking lot or a lonely road. The parking lot should be pretty big, like from a mall, without any cars or trees! You should be far away from walls, trees or anything which could possibly reflect. 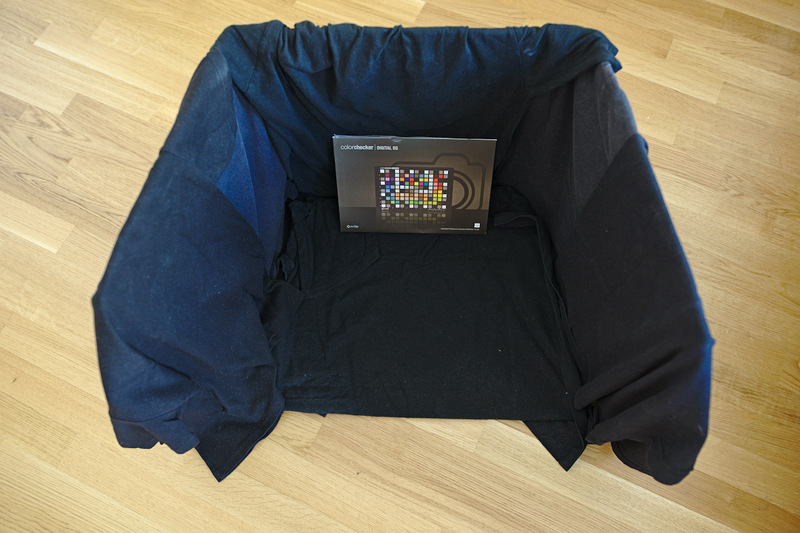 Put the box on the ground or a small chair and shoot with the sun above your right or left shoulder behind you. You can use a black fabric (bed sheets) if the ground reflects. Avoid all windows and stained glass. 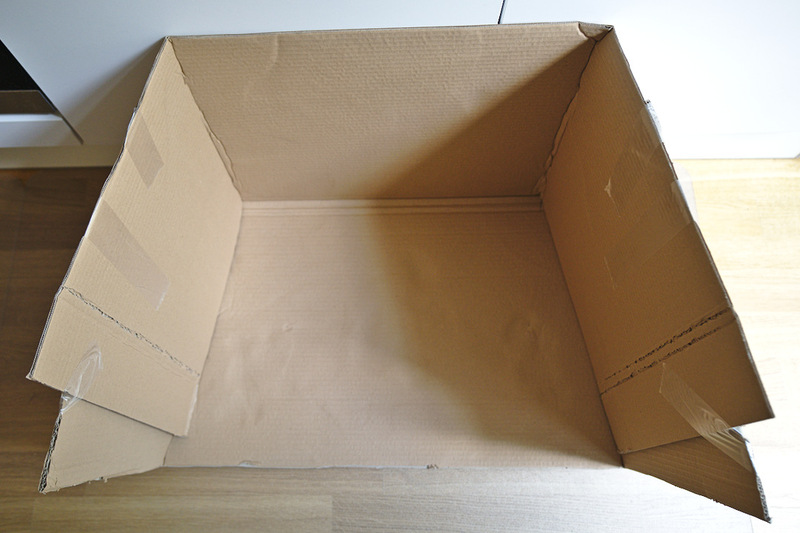 Create the box as mentioned, and arrange it in a V shape with your tripod. At the top left of the V is the camera, at the bottom is the color target, and at the top right is the light source. The right source should be bright and even across the room and your setup. Position yourself underneath it to avoid all shadows. How to shoot the target? Start white balancing your camera outside your house, office etc. with a gray card every hour or 30 mintues in the morning and write down the time and temperature. This way you will find out when the sun provides the right temperatue (5000K) to take pictures for your target. If you’re shooting outdoor, do the following preparations at home. You will not have much time for taking the pictures of your target. You only have a Window of about 10 minutes. An assitent in the field can be useful. You should use a prime lens for taking the pictures. If possible a 50 mm or 85 mm lens (or anything in between, numbers are for full frame). The less glass the light has to travel through the better it is for profiling. Thus those two lenses are a good choice in the number of glass elements they have and their field of view and also vignetting! With a tele lens we would be too far away and with a wide angle lens we would need to be too near to have just the black box in the picture. Make sure that Dynamic Range Optimization (DRO) and Auto HDR (High Dynamic Range) or anything like that are turned off! Set the camera to capture “RAW & JPEG” and disable lens corrections (vignetting corrections) for JPEG files if possible. This is important for JPEG and real color fitting. You can leave corrections for color failures turned on. Set the ISO to the lowest possible value. Some cameras have an extended ISO range, don’t use any of those values. For example my camera offers ISO 50, ISO 64 and ISO 80. Those are extended ISO values. The lowest ISO not in the extended range for my camera is ISO 100. Check your camera manual! Be there in advance so you have time to prepare everything. Make sure the color chart is parallel to plane of the camera sensors so all patches of the chart are in focus. The color chart should be in the middle of the image using about 1/3 of the screen so that vignetting is not an issue. Shoot the target, zoom to 100% and check for glare and reposition if necessary! In Figure 3b you can see a patch with extreme glare. In Figure 3c you can see a patch with a bit of glare. You should try to get no glare at all. Make sure the sun is shining at an angle on the Color Checker. Change the angle of the target in to box till you get no glare! If your camera has a custom white balance feature and you have a gray card, create a custom white balance profiles till you get 5000K (D50) and use it (see figure 3). 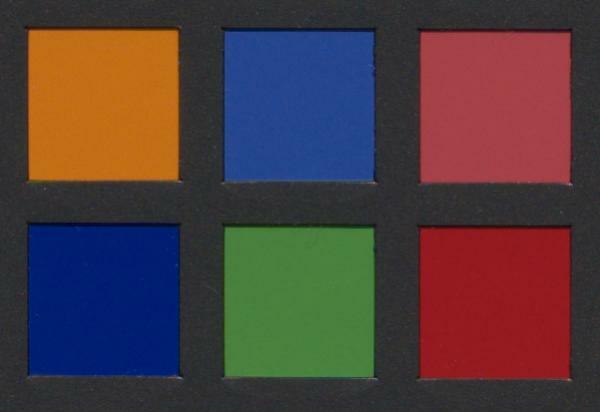 Put the gray card in your black box in the sunlight or artificial light at the same position as the Color Checker. If you don’t have a gray card, you have to use Auto White Balance (AWB) and find other ways how to measure when you get 5000K from the sun. Once you get 5000K from the the sun, you have about 10 minutes to take the pictures of your target! Now you want to begin taking images. Normally we want to have a camera profile just for the lowest ISO value. Note: I created profiles for ISO 100 to ISO 640, because my camera has a gain switch at ISO 640. I learned about that by inspecting the charts which have been measured by DPReview. You need to take 5 pictures of your target. This is so that if an image is over or under exposed, you have an image with a stop above or below that is then exposed correctly. One photo for -0.3 EV, 0 EV, 0.3 EV, 0.7 EV and 1.0 EV. Some cameras (Fuji) ISO 100 is an Extended value, so use ISO 200. Normally Extended ISO values are captured with the lowest physical ISO and overexposed and then exposure is reduced with image processing. Use the lowest ISO profile for them. Hint: Some cameras have a “Continues Bracketing” feature. You can set this to 0.3EV and 5 Images. Then the camera will automatically capture 5 images in 0.3 EV stops (-0.3 EV, 0.0 EV, 0.3 EV, 0.7 EV, 1.0 EV) for you. Once you have done all the required shots, it is time to download the RAW and JPEG files to your computer. The ColorChecker Passport has actually two gray ramps. The neutral gray field is the field on the bottom right of the color target ramp and is called D1 (see Figure 4). For the ColorChecker SG it is the patch E5 and for Wolf Faust’s IT8 target the one on the left of the gray ramp (GS0). It should be described in the specification of your target. If we check the CIE file, we will find out that the neutral gray field D1 has an L-value of: L=96.260066. Lets round it to L=96. For other color targets you can find the L-value in the description or specification of your target, often it is L=92 (e.g. Wolf Faust’s IT8 GS0). Better check the CIE or CGATS file! You then open the RAW file in darktable and disable the base curve and all other modules which might be applied automatically! You can leave the Orientation module turned on. Select the standard input matrix in the input color profile module and disable gamut clipping. Make sure “camera white balance” in the white balance module is selected. If lens corrections are automatically applied to your JPEG files, you need to enable lens corrections for your RAW files too! Only apply what has been applied to the JPEG file too. Apply the changes to all RAW files you have created! You could consider making a “profiling” style and applying it en-masse. 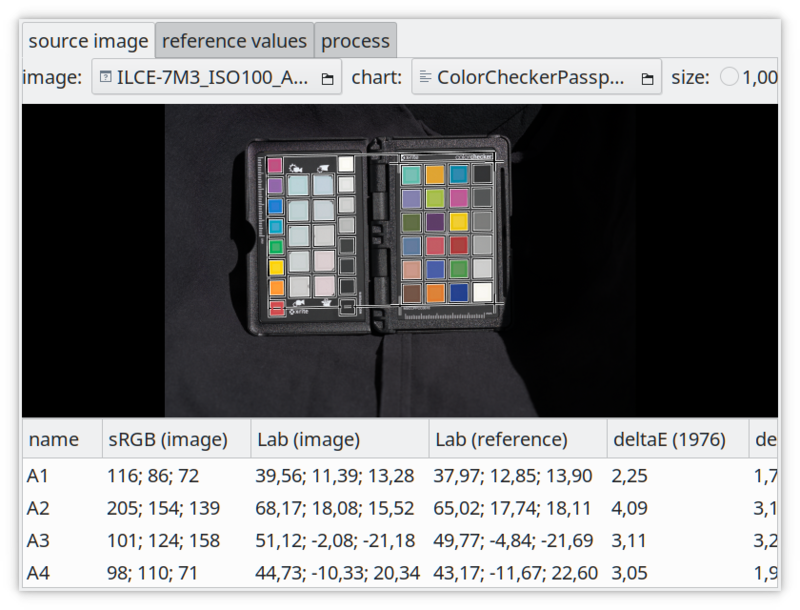 Now we need to use the global color picker module in darkroom to find out the value of the natural white field on the color target. 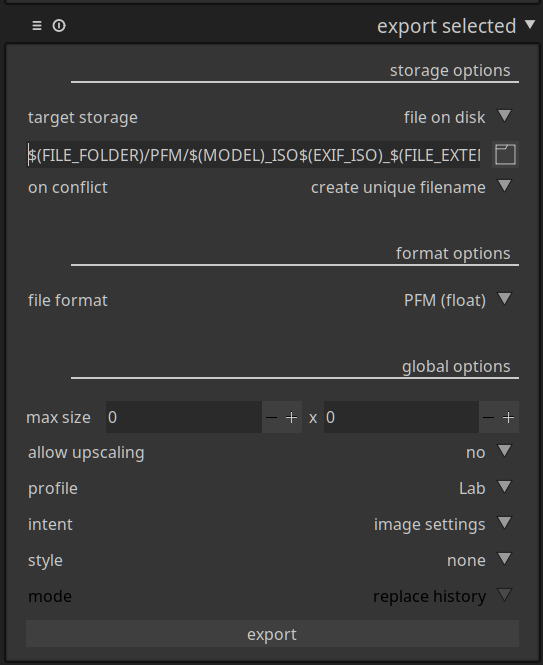 Open the first RAW file in darkroom and expand the global color picker module on the left. If the value displayed in the color picker module matches the L-value of the field or is close (+0/-2. This means L=94 to L=96 is acceptable), give the RAW file and the corresponding JPEG file 5 stars. In the picture above it is the first value of: (96.491, -0.431, 3.020). This means L=96.491, which is what you’re looking for on this color target. You might be looking for e.g. L=92 if you are using a different Color Checker. See above how to find out the L-value for your target. For real color profiling this is very important to get right. Additionally you want to check the JPEG is registering a L=96 (+0/+2) tolerance. You do not want overexposure here (L=100 is white)! If your images are over exposed, your profile will actually darken the images (this is not what you want). 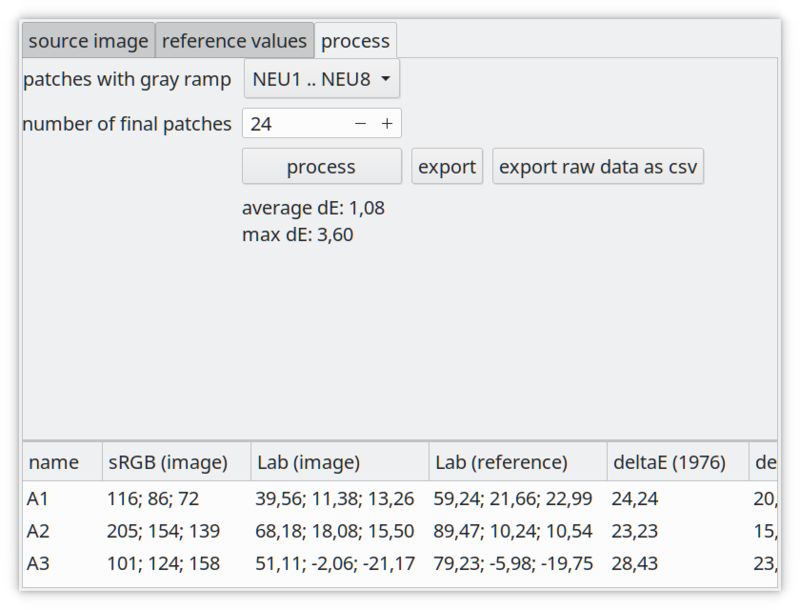 For profile extraction, this is less important as darktable-chart will extract the differences between the raw and the JPEG, and will assume the camera’s exposure level was correct. This means if your camera “thinks” a good exposure is L=98 for the JPEG, and the RAW reads as L=85, then your profile needs to create the difference here so you get the same effect. Or you always enable it by setting allow_lab_output to TRUE in darktablerc. Make sure that you have closed darktable before making this change, then reopen it ( darktable writes to this file and may erase your change if you edit while darktable is running). Remember to select the Lab output color profile here as well. You need to export all the RAW and JPEG files, not just the RAWs. Select all 5 star RAW and JPEG files and export them. 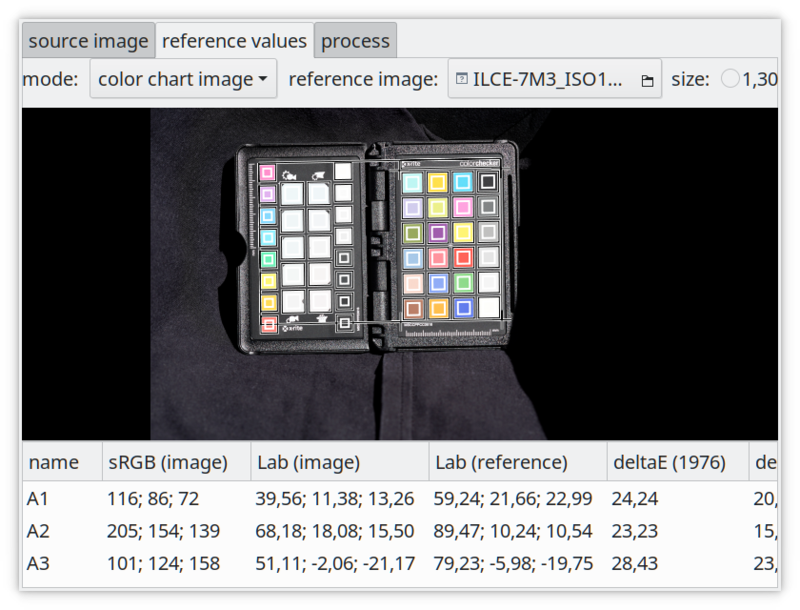 In the source image tab, select your PFM exported RAW file as image and for chart your Color Checker chart file. Then fit the displayed grid on your image. Make sure that the inner rectangular of the grid is completely inside of the color field, see Figure 8. If it is too big, you can use the size slider in the top right corner to adjust it. Better too small than too large. This is the only step where the process diverges for real color vs camera profile creation. If you are creating a color profile to match the manufacturers color processing in body, you will want to select color chart image and as the reference image select the PFM exported JPEG file which corresponds to the RAW file in the source image tab. Once opened you need to resize the grid again to match the Color Checker in your image. Adjust the size with the slider if necessary. It’s worth checking the ‘Lab (reference)’ values at the bottom of the display to ensure they match what you expect and were correctly loaded. I saw some cool (but incorrect) results when they did not load! In this tab you’re asked to select the patches with the gray ramp. 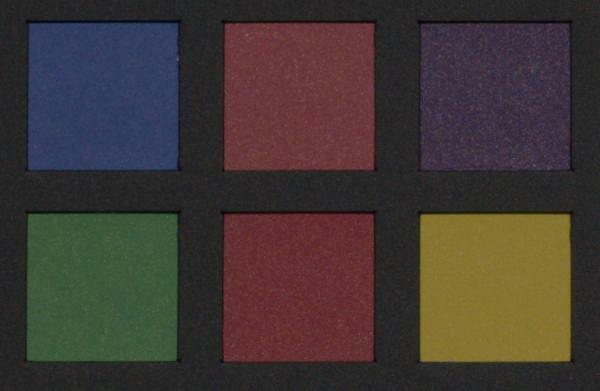 For the ‘X-Rite Color Checker Passport’ these are the ‘NEU1 .. NEU8’ fields. 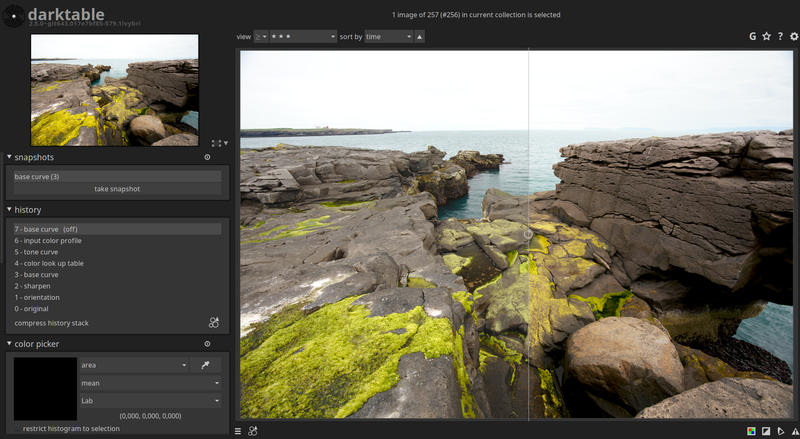 Newer version of darktable automatically detect the gray ramps! The input field number of final patches defines how many editable color patches the resulting style will use within the color look up table module. More patches give a better result but slows down the process. I think 28 is a good compromise but you might want to user the maxium of 49. Once you have done this click on ‘process’ to start the calculation. The quality of the result in terms of average delta E and maximum delta E are displayed below the button. These data show how close the resulting style applied to the source image will be able to match the reference values – the lower the better. You must click process each time you change source images or reference chart to generate the new profiles. Sometimes process is “greyed out”, so simply toggling the grey ramp setting will reactivate it. After running ‘process’, click on ‘export’ to save the darktable style. In the export window you should already get a good name for the style. Add a leading zero for ISO values smaller than 1000 get correct sorting in the styles module, for example: ILCE-7M3_ISO0100_JPG.dtstyle. The JPG in the name should indicate that we fitted against a JPG file. If you fitted against a CIE file, remove the CIE filename from the style name. If you applied a creative style (for example, a film emulation or filter in the camera). to the JPG, probably add it at the end of the file name and style name. To use your just created style, you need to import it in the style module in the lighttable. In the lighttable open the module on the right and click on ‘import’. Select the dtstyle file you created to add it. Once imported you can select a raw file and then double click on the style in the ‘style module’ to apply it. Open the image in darkroom and you will notice that the base curve has been disabled and a few modules been enabled. The additional modules activated are normally: input color profile, color lookup table and tone curve. To verify the style you created you can either apply it to one of the RAW files you created for profiling. Then use the global color picker to compare the color in the RAW with the style applied to the one in the JPEG file. I also shoot a few normal pictures with nice colors like flowers in RAW and JPEG and then compare the result. Sometimes some colors can be off which can indicate that your pictures for profiling are not the best. This can be because there were some kind of clouds, glare or the wrong daytime. Redo the shots till you get the result you’re satisfied with. Sadly this is a trial and error process, so you will have to create some number of profiles before you find the results you want. It’s a good idea to read this article again to see if you missed any important steps. 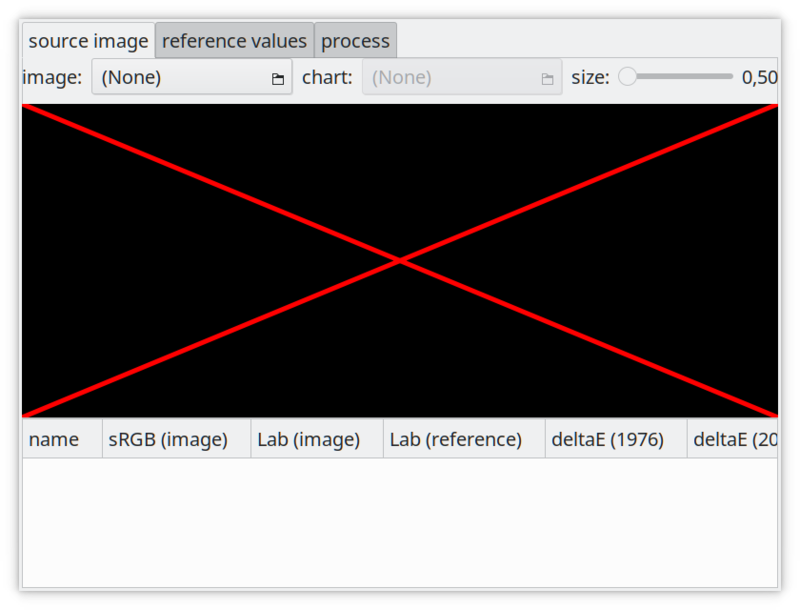 In the following screenshot (Figure 11) you can see the calculated tone curve by darktable chart and the Sony base curve of darktable. The tone curve is based on the color LUT. It will look flat if you apply it without the LUT. This process will work for extracting in-body black and white profiles, as well as creative color profiles. I see a significant improvment in black and white profiles from this process over the use of some of the black and white modules in darktable. You may find that the lowest ISO profile may provide pretty good results for higher ISO values. This will save you a lot of time profiling, and allows you to blanket-apply your profile to all your images quickly - you only need one profile now! This is highly dependant on your camera however, so experiment with this. These profiles should work in all light conditions, provided your white balance is correct. Given you now have a color target, you should always take one photo of it, so you can correct the whitebalance later. As always the ways to get better colors are open for discussion an it can be improved in collaboration. William Brown has contributed to the article, based on his profiling experience following this tutorial. To make shooting the pictures faster, you can use aperture control and bracketing, if you camera supports bracketing with 5 pictures in 0.3 EV stops. Hi there. Great post, really interesting. I think it would be great to be able to do this, and a useful improvement especially as I’m colour blind. EDIT: I have since submitted corrections and clarifications to the original article, so most of these comments are now invalidated. Thanks for reading! However, in the post, there are a few points I got lost on. I think perhaps you make some assumptions or skip some bits of knowledge in the process that might be obvious for yourself, but makes it harder for someone to follow as a ‘first time’. You talk about taking the photos with exposure bracketing, but you never mention again how this affects the process, or how to use the exposure bracketed photos, or how the affect the resultant style. Could you please elaborate on this more? Generally, you also jump between “jpg” and “raw” setups, and in the end I’m really lost about the steps and how they change. Do I export a jpg to pfm and calibrate on that? Do I use the original jpg? Do I export raw to jpg and use that? Or raw to pfm? I think you need to improve the distinction in steps for jpg compared to raw at each point of handling. as the article points out, there are many options of colour targets to choose from. the one that is actually used in the images here as very few patches indeed. creating a lut profile from these sparse sample points may introduce artifacts. it may also work well for you, but i would not bet on it unless the target has, say, > 200 patches. Are there any affordable targets with that many patches? I was on vacation the last three weeks cycling through Iceland, so I just saw you comments and changes now. If you’re camera allows to do exposure bracketing you can tell it normally to do 5 images in 0,3 EV stops. So I don’t have to take take a picture adjust the shutter speed, shoot and do the same again. I can just tell my camera take 5 pictures. So i Get -1, -0.7, -0.3, 0, 0.3, 0.7 and 1.0 EV images and one of them will have the correct exposure. A CIE file is e.g. shipped with ArgylCMS it is the file which specifies the exact color value of a patch on your target. It is the reference. You can either create a style against a camera JPEG or against the real color value of your target using the CIE file. You can choose what you want to match against in darktable-chart. The RAW and JPEG file need to be converted to PFM for darktable-chart. I think maybe you missed the edit on my comment. I actually solved most of these steps, and submitted some updates to the article to make certain parts clearer based on my own experiences. Thanks! I think maybe you missed the edit on my comment. Editing should only be done to fix small typos or stuff like that. Changing the actual content of a post means that all people not looking at the website will miss it. I’ve added some small improvements, like widening up the box to the front. This way you get less shadow in the box. Hi @asn, i dont understand where i wrong but i cant do it. I used cht and cie files in your article links because i have an xrite passport, this is right? I want to have a real colors profile, in this case the jpg is not important right? If you match again the CIE file, you match against real color. However the Engineers of your camera want the developed pictures look pleasant and you normally want the same great look, that’s why you match the JPG. However you can do both and then choose what you prefer. In hindsight I think that I should have posted my questions in this thread. Ooops. I found another set of instructions. These were written by Pascal de Bruijn at https://encrypted.pcode.nl/blog/2010/06/28/darktable-camera-color-profiling/. Bear in mind that Pascal posted his instructions 8 years ago and that he used Ralf Faust’s IT8 target with ArgyllCMS rather than using X-Rite’s ColorChecker Passport with darktable’s own profiler. Nevertheless I think that I’ve been able to patch some of the holes in Andreas’ article. Before we continue and so that we don’t go down the wrong path like we would, as Andreas implies would happen, if we follow the course that Harry Durgin (my darktable hero!) provides, Andreas, are you okay with what Pascal has written? If not, once again, why not? Andreas, are the above correct or, am I still missing something? I think that Andreas’ call for dialogue is quite appropriate in light of the different guidance provided by a number of parties with unique experience and hence, ideas, about camera profiling. In trying to muddle my way through this process I’ve found some instructions espoused by various learned individuals to be in direct conflict with others, some apparently superfluous, and others baffling (at least from my inexperienced perspective). With this in mind, I hope that we can move this forward in order to build consensus amongst the experts so that plebes such as me can benefit from their combined and properly-distilled wisdom. To me, at least, the last one is the most important. Yet with today’s popular trend of coaxing increasingly unnatural visual interpretations from photographs until they resemble soft-core LSD trips, this also seems to be pointless for disciples of such wizardry. I can only tell you that you have to try out and share your experience. I haven’t tried this. Camera engineers put a lot of thinking into how to develop the camera produced JPEG files. It is the best to match them. However you would need to first get really good results without changing the white balance or anything else. With that you have a baseline and check what happens if you change the white balance. Then compare how accurate it is. Camera manufacturers put a lot of thinking into how to develop a RAW into a JPEG. Also those are normally very pleasing unless you apply Creative Style. The default is normally extremely good and sometime photographers don’t do any RAW processing as the JPEG is just fine. However if you want to do process a RAW, you want to start from a already a good starting point, and that’s the colors and standard curve applied which a JPEG already has. Then start correcting the errors. I don’t know what camera manufacturer you have, but my cameras JPEG files just look awesome and they are not over-saturated. I found a lot of different documentation, the article is the process I used and e.g. @firstyear was able to get really good results from it. He also contributed to the article. I’m not a master of color, I’m just a simple user who tries to spend less time developing RAW pictures and instead go out and shoot pictures. I spent a week following this article, contributing back and working on it - and in the end I wrote this response based on my lessons: https://636.photos/blog/blog/why-i-shoot-jpg/ For me, it was a wonderful learning experience to help @asn with this article, and to learn more about colour myself. If you want to learn more about colour, how it works, and how cameras and software process it, profiling is a great way to learn that. If you want to shoot RAW’s and spend time editing them later, then profiling can help you apply some great effects and corrections, along with the power of most RAW editors. If you want to just go and take photos, perhaps skip over this as a “fun read” and use the tool in your hands - your camera. It’s produced by X-Rite with, apparently, an advanced audience in mind. As such, the sole focus (hey: another pun!) is on reproducing real-world colours rather than fiddling to emulate what some OEM engineer has dictated that you should be seeing . What I found to be interesting (and quite logical) is that the video’s author suggests that the best thing to do is to profile the camera for each unique shoot. Because after all, reflected colours will change based on a number of variables including not only the light source, the mix of sources, the colour of the immediate environment, but even the colour of a model’s dress! Unfortunately, the video doesn’t show how such profiling can be optimised in darktable (for some deluded reason the author uses an arcane commercial product with the name of Light-something-or-other ). Nevertheless, I think that by cobbling together some of the good suggestions within this article, some from the X-Rite video, some from The Eminent Harry Durgin’s videos and some from other sources (including Pascal de Bruijn’s ancient but still-relevant article) we should be able to come up with something quite effective. What would be really great (Bill Ferguson, are you listening?! ), is if the process can be made easier by being able to automate most of it (primarily calling and running darktable-chart) with a lua script ! The article is about creating a general purpose daylight camera profile. This works for most conditions! The video you link is about profiling a scene and matching to real color. That’s something different and something for another article.